Rapper 50 Cent is no longer at battle with the company he said charged him multi-millions to turn his sprawling pad into a bling-filled home befitting a mega-star. He has settled his suit against BVH Integrated Services over work done at his Farmington manse, the Hartford Courant reports. The settlement details are not available, according to the Courant. The cottage at the center of the case is a 19-bedroom, 51,000 square foot mega house that 50 Cent had been trying to unload for the last two years. The MTV Cribs meets the Money Pit saga began in September 2003 when 50 Cent, or Curtis Jackson, bought the house from Mile Tyson’s ex wife for $4.1 million. 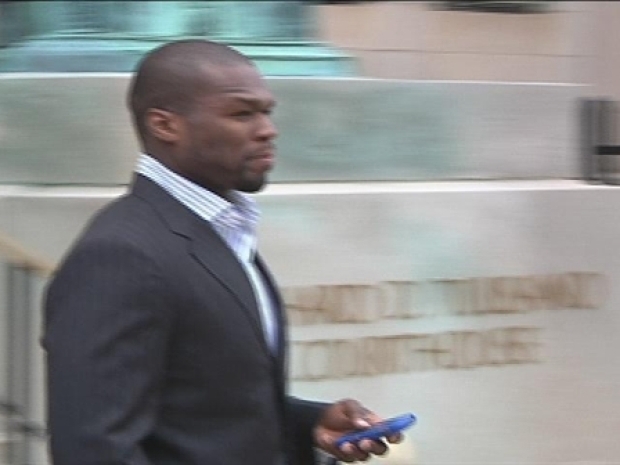 Rapper 50 Cent appeared in a Hartford court on Tuesday to testify against the engineering firm he is sueing that fixed up his Farmington mansion. Then, 50 started with the renovations. The estimate was $500,000, according to the suit he filed. An enormous sum for many of us, but 50 Cent was OK with it and thought that was "a legitimate assessment of what it would cost to keep things up to speed," he said. Attorney Michael Feldman says Jackson wouldn't have bought the mansion had he known renovations would be so expensive. But somehow, the costs started to add up -- to $6 million, according to news reports. Of the $6 million, about $3 million of that was excessive, Curtis’ crew claims. BVH attorney Michael Byrne says Jackson wanted "extravagant and costly upgrades." Part of the renovation work seemed to have been adding a dancing room with stripper poles, but those would have to be some pretty precious poles to add so much ca-ching to the budget. “He’s put a lot into it, and it’s all very tasteful, except the stripper poles,” Curt Clemens, owner of Century 21 Clemens & Sons in Hartford, told the Hartford Courant in 2007. The house was on the market, but now it’s not. Real estate agents recently told the Hartford Courant that the listing for the Farmington house is expired and has not been re-listed. After 722 days, there were no buyers. After all the renovations, 50 Cent was asking for $14.5 million, down from the $18.4 million he was originally asking for, the Courant reports. Someone’s going to have to pay for those stripper poles.